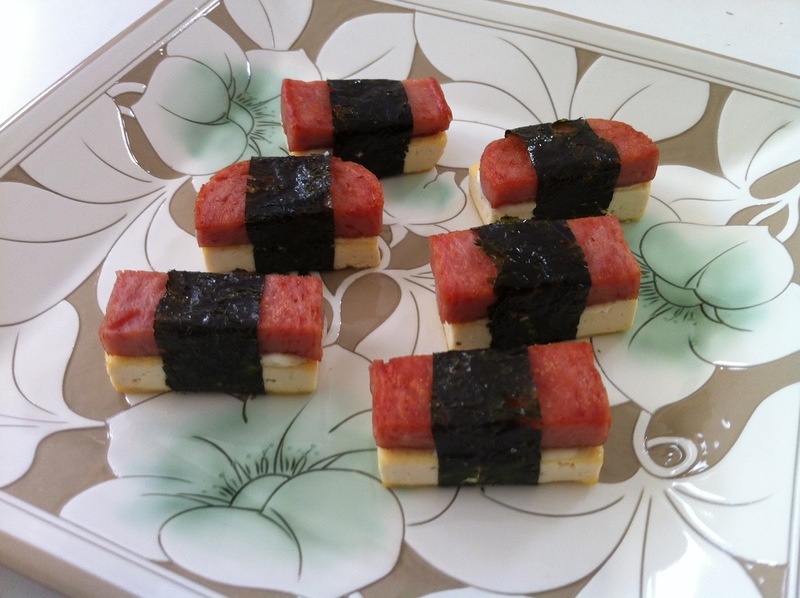 spam musubi | what is clara eating today? ok… this is not the healthiest thing to be giving to your child, but i love spam musubi and it is very quick to prepare, so i do make it for clara once in a while if i don’t have much time or haven’t gone grocery shopping in a while… for rest of the family, I make it the same but with brown rice instead of tofu. Cut spam into 6 rectangles. Grill in a pan with 1t of canola oil. Set aside to cool. Cut tofu as same size as spam. Grill in a pan with 1t of canola oil. Set aside to cool. mix mayonnaise with sesame seed. To assemble, take a piece of tofu, and spread mayonnaise mix on top. Top it with a spam piece. Use nori to wrap it around. Secure with little bit of mayonnaise. Repeat for remaining 5.